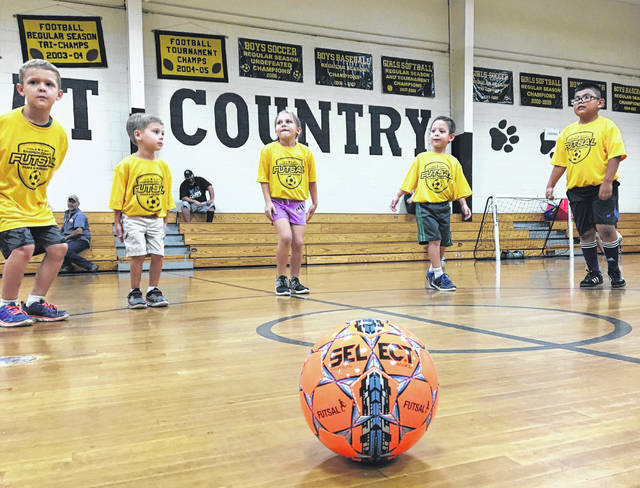 Nearly 100 children are participating this year in the Sampson County Parks and Recreation Futsal Program. Futsal is a variant of soccer, or futbal, played on a hard court smaller than a soccer field and mainly indoors. It is often five players a team, with one of those players being the goalkeeper. While this is the second year of the program in Sampson, it is the first year the program has had a competitive division. Clinics were just held. The clinical age group is ages 4-8 and the competitive division is 9-15. There are 95 children participating in the program in four districts throughout the county, with the competitive division having six teams — two from Hobbton (Eastern District), two from Midway (Northern District) and two from Union (Southern District). The younger children in yellow are pictured during their recent clinical session at Hobbton. The older children in yellow and red played at Union in the first competitive futsal match of the year.